What a useless but funny gadget, but still... people invent these. This invention of Ryan McFarland (also known as Lord of the Homeless) is made especially for those who likes sports and shopping but have no free time for both. 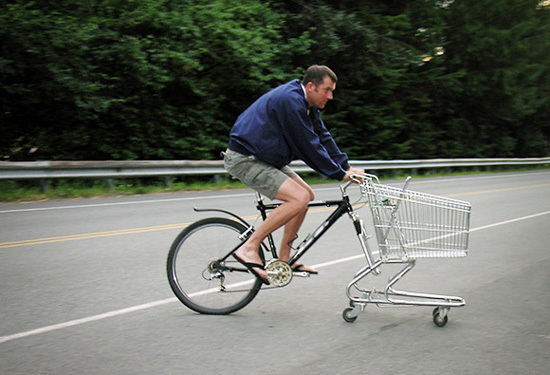 The secret is simple: the inventor took the front tire off his bike and replaced it with a shopping cart. So now you can enjoy outdoor sports! More than that, this funny construction looks very sweet and raises yours spirits and those of surrounding people. This simple gadget makes it possible to haul big amounts of products that you usually purchase in the market. Though the cart is in front of the bike it doesn't limit your view. It is also important to mention that the steering is limited that makes it possible to keep the balance and not fall over. So you can begin learning to ride the bike with this one and don't be afraid of a wonky wheel. You can take it with you on a picnic. Just imagine: a whole family riding these gadgets. Healthy, funny and comfortable! So I can propose a name for such invention: Healthy body & Healthy soul!